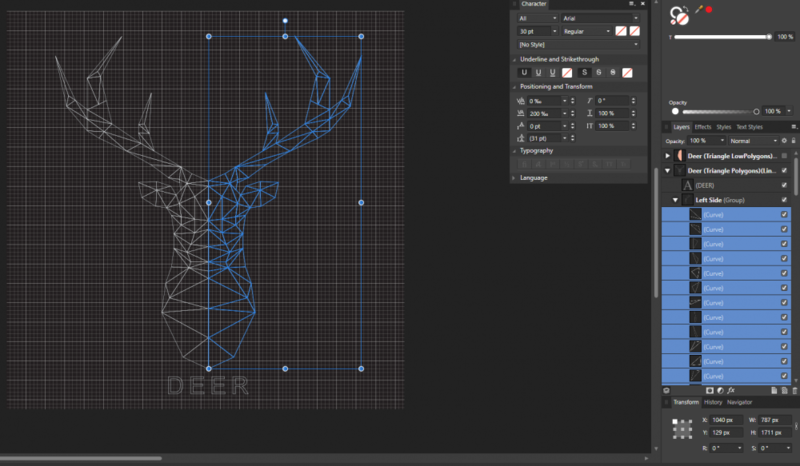 I made abstract deer with triangles. When i try to join shapes (triangles) into one with Operations: Add I get following problem which can be seen on screenshot 2. Is there any other way to join shapes without getting problem/loosing shapes i made. Why are you trying to add them all together? If you do that the resulting "(Curves)" shape -- note the plural -- can only have one color. Is that what you want? I am trying to simplify them in bigger shapes which are easier to edit, since i ll export it as EPS and i want my person who ll download the file to be able to edit it easy. If there is a way please i would like to know. 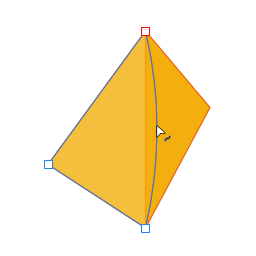 Choose the Node Tool and drag on the middle of the edge of one of the triangles so that it curves outwards to overlap the edge of the adjacent triangle, and then repeat with the remaining triangles until they all overlap slightly. Now when you ‘add’ them you will get a single shape with no extra lines. If you want a single fill but multiple lines, you will need to duplicate everything. Select all, copy to the system clipboard and ‘add’ the shapes after tweaking as described earlier, and then paste back the copied individual triangles so that you get your lines back. If you combine them into bigger shapes, each of them still must have their own individual fill & stroke type (a solid color or one of the gradient options). So you can't have both bigger shapes & at the same time have smaller triangular subsections in them that retain different fills or strokes. A shape is defined by a single path -- there is no way to get around that. What do i need to do with node tool exactly? like add points and overlap them over triangle which is under one im editing? No, you don't add any points/nodes. You just hover over the middle of the line, mouse down to 'grab' it and then keep the mouse button held down while you move to a new position. The line will bend, but no new nodes will be added when you mouse up. A shape is defined by a single path -- there is no way to get around that. Attached doc contains one shape with three paths. Technically, it is a Curves layer containing three shapes, each with its own path. The 'one fill/one stroke color' rule still applies to Curves layers created by the Add operation. That is not how you made your example (which would have filled in the two interior transparent areas) & is not relevant to what the OP wanted to do. Technically, it is a Curves layer containing three shapes, each with its own path. 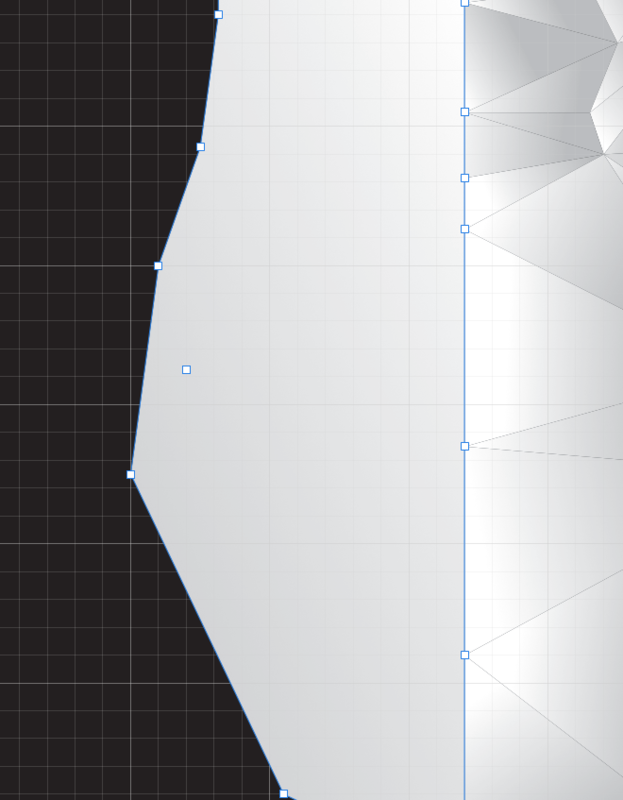 Actually, my example is one shape comprised of three paths (curves in Affinityspeak). The 'one fill/one stroke color' rule still applies to Curves layers created by the Add operation. That is not how you made your example (which would have filled in the two interior transparent areas) & is not relevant to what the OP wanted to do. I'm fully aware that what I did (convert Art Text to Curves) and what the OP wants to do are different, but my post was in response to your, in my opinion, misinformation which I specifically quoted: "A shape is defined by a single path -- there is no way to get around that." The glyph before conversion was also a shape comprised of three paths. In Affinityspeak, your example is one 'Curves' object, not three. If divided, that object (also known as a polycurve) will yield three closed curves. Nobody has claimed my example is three Curves objects. Obviously it is a single Curves object: the Layers panel contains only one Curves object. My object is not a polycurve. A polycurve is comprised of joined curves/paths, whereas my object has three separate curves/paths. Do you agree that my undivided "g" should be considered to be a single shape? Nobody has claimed my example is three Curves objects. It looked very much as though you were equating paths with curves, and stating that there are three of them in your example. Sorry. I could have phrased things a little more clearly. It's easy for miscommunication to develop over the the word "curves" when the Affinity apps have both "Curve" and "Curves" objects. Sorry. I could have phrased things a little more clearly. It's easy for miscommunication to develop over the the word "curves" when the Affinity apps have both "Curve" and "Curves" objects. IOW, "a geometric figure such as a square, triangle, or rectangle," which if you look it up is one of the several definitions of the word found in any ordinary dictionary. Regarding "polycurve," it is a term specific to a few software apps but it does not have a definition consistent across them all. For example, this definition from Rhino is simply "A curve consisting of two or more curves joined together." In Affinity-speak, that would be any curve with more than two nodes, open or closed. "Curves" may not be the best possible choice to avoid confusion, but particularly considering that the Rhino definition or its equivalent is what Google & similar search engines fill the first page of hits with it, IMO "polycurve" would be a far worse choice. I’m afraid I can’t agree with the concluding sentence in that paragraph. If you refer to the definitions on this page from Rhino, you’ll see that the word “polycurve” is not used in the descriptions of the InterpCrv and Sketch methods, despite the fact that the resultant curves clearly have more than two nodes. I think it’s simply that their definition of a polycurve is poorly worded: if you “combine” any two curves, or if you “add” two non-overlapping curves, you get a polycurve. Your screenshot shows the shape as it appears when selected with the Move Tool. You need to switch to the Node Tool if you want to adjust the nodes/points. I’m afraid I can’t agree with the concluding sentence in that paragraph. If you refer to the definitions on this page from Rhino, you’ll see that the word “polycurve” is not used in the descriptions of the InterpCrv and Sketch methods, despite the fact that the resultant curves clearly have more than two nodes. I think it’s simply that their definition of a polycurve is poorly worded. The definition on that page is essentially the same as all the others I could find, basically that "A polycurve is several curve segments joined together end to end," or words to that effect. It is a very generic term, including polygons, "polylines," the curves that result from various curve fitting methods, & so on. It would include all the parametrically adjustable Affinity shapes like stars, cogs, & donuts/pies, & anything drawn with the Pen Tool except for straight 2 node lines. The word has no common everyday definition that I could find in any regular online dictionary. As best as I can tell it a somewhat obscure bit of technical jargon unique to a few, mostly 3D apps, however it might have been used in the Serif apps not withstanding. I have mentioned before that I am not a big fan of the "(Curves)" designator -- it is too easy to overlook the "s" & for named layers or deeply nested layer hierarchies it is likely to be truncated in the Layers panel, but I would be even less a fan of "(Polycurve)" -- it just seems much too generic & confusing to me. What I would really like are more compact, iconic designators for layer types, ideally appearing on the left before names, similar to the Frame & Artistic text designators, but I know not everyone would like that either. Lines between triangles are gone. The lines are gone because the triangles are gone! If you want to adjust the shapes, there’s no way to do it after you’ve added them together: you have to go back to the original triangles, make your adjustments, create copies as described earlier and then add them together again. What I would really like are more compact, iconic designators for layer types, ideally appearing on the left before names, similar to the Frame & Artistic text designators, but I know not everyone would like that either. That’s the problem in a nutshell, isn’t it? The developers are never going to please everyone!